Before discussing heated blower dryers, it’s important to review common types of desiccant dryers starting with the heatless style, which is the simplest type. There are other less common desiccant styles, but this article will not discuss them. 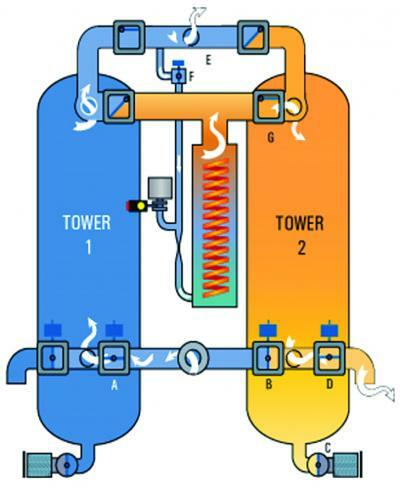 All typical desiccant dryers have two pressure vessels filled with desiccant beads and a system of controlled valves that directs the compressed air flowing through the dryer through one or the other vessel. The desiccant beads only have a certain capacity for removing water vapor from the compressed air (adsorption) before they become saturated. Once they reach capacity, the moisture must be removed from the beads in a regeneration cycle, or the dryer will fail to do its job in removing enough water to pull the compressed air dewpoint down to low levels. Just before desiccant capacity is reached, the dryer is designed to switch the flow of compressed air to the other regenerated vessel full of desiccant and to start the regeneration process on the saturated bed of desiccant. To regenerate the desiccant, the vessel being processed is blown down to atmospheric pressure, and a flow of already dried compressed air is passed through the beads. When this dry compressed air is expanded to atmosphere, its dewpoint falls considerably, allowing it to better remove the adsorbed moisture from the saturated beads. This cycle operates on a typical 10-minute cycle, with the towers alternately drying and regenerating. This regeneration process on a fixed-cycle dryer will consume about 15 to 20 percent of the dryer flow rating. It is important to understand that the purge is 15 to 20 percent of the rating of the dryer, not the flow going through it. This makes a difference if the dryer is lightly loaded, for some reason. This means if the dryer is only half loaded, for example, a fixed-cycle desiccant dryer will be consuming not 15 to 20 percent of the average flow, but 30 to 40 percent. It is very common to find facilities where the dryer is consuming most of the compressed air the air compressors produce. This makes a compressed air auditor very suspicious of desiccant dryers. Because this purge consumption robs the air compressors of capacity, designers of the past came up with different versions of desiccant dryers that use less air, one of which is the externally heated purge style. Similar to the fixed-cycle heatless dryer, some already dried compressed air is used to regenerate the desiccant, but by first running the air through an electric heater and then sending through the saturated bed. This change in design allows a smaller flow of compressed air to be used, about 7.5% of the rating of the dryer, freeing up more compressed air to be used to feed compressed air demands, and reducing the overall electrical operating cost. This type of dryer is slightly larger than a heatless design, but operates on a four-hour cycle. Further design developments produced the heated blower style of dryer. It uses blower-powered ambient air passed through a heater element to provide hot regeneration air to condition the desiccant. This dryer does not use compressed air for the regeneration process, allowing all of the compressed air produced by the air compressors to pass through to feed plant demands. There is, however, a cooling flow that needs to be considered. The problem is that very hot desiccant does not remove moisture from compressed air. Therefore, when heated style dryers finish the heating cycle, an amount of compressed air is passed through the desiccant to remove the heat. In externally heated dryers about 7.5% of the rating of the dryer flows during the cooling cycle, typically lasting about one hour of the four-hour cycle. For heated blower style dryers the cooling purge is usually specified as 2% of the dryer rating, but here we need to read the fine print. This 2% is actually a flow of 8% for one hour every four hours for an average of 8%. This 8% may have unintended consequences during peak demand periods where air compressors are at maximum capacity, possibly requiring additional air compressor capacity. Newer designs of blower style desiccant dryers use a built in closed-cycle cooling loop where the blower recirculates the internal air through the desiccant to remove the heat, there is no compressed air cooling. In this design there will be some sort of heat exchanger built into the loop using ambient air, or cooling water to remove the heat. Since compressed air is expensive to generate, the cost of using it to generate a purge flow is high. In addition, if 15 to 20 percent is coming off the top of your air compressor’s capacity you will need to purchase 15 to 20 percent larger air compressors for the same compressor room flow output. The use of heaters, and lower levels of compressed air for regeneration, frees up more air compressor capacity and results in lower operating costs. Typical cost to operate various styles of fully loaded dryers. Note the operating costs calculated assume the dryer is 100% loaded at maximum capacity. Air compressor efficiency is assumed to be 20 kW per 100 cfm and power costs are 10 cents per kWh. Annual costs assume 8,760 hours of operation. This table shows considerable annual savings can be gained by using more sophisticated heated style dryers. In real life you would not usually see an air dryer at exactly 100% load at the standard rating of 100 psi input pressure, 100 oF inlet and ambient temperature. Usually the dryer loading is less than the rating, so the operating costs could reduce with lighter loading. For example, a dryer that is only passing 75% flow, with inlet temperature at 80 oF, is only processing about 40% of the designed water vapor. This is because air that is 20 degrees cooler than designed contains only roughly 50% of the water vapor compared to the 100 oF dryer rating. 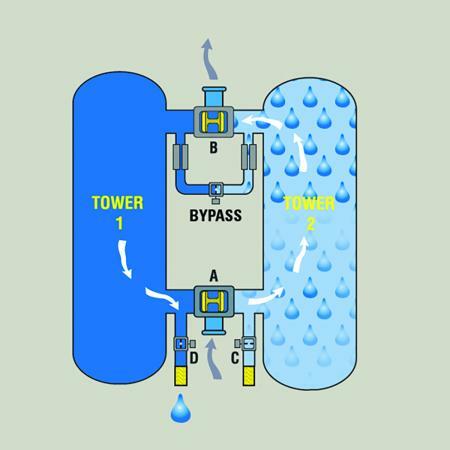 For a fixed-cycle desiccant dryer, operation with lower moisture load does not affect operating costs, yet it will still consume the same amount of purge air. But with heated dryers, because the desiccant contains less moisture, and the heaters are controlled on temperature (to avoid overheating the desiccant), the heating element duty cycle will reduce, lowering electrical operating costs. For partly loaded air dryers some significant savings can be gained using dewpoint-dependent switching. With this scheme, a dewpoint probe measures the compressed air at the dryer discharge and will delay the purge operation should the produced dewpoint be lower than the dryer rating. The dryer control will wait until the dewpoint rises to the dryer setpoint and then activate a regeneration cycle. For lightly loaded dryers this produces a reduction in energy consumption, but the different styles of dryers react differently to light loading. For heatless desiccant dryers, the reduction in purge tends to be proportional only to the reduction of flow, not the reduction in moisture load due to the lower inlet temperatures. But for heated style units, the dryer reacts to both reductions. This means some energy is saved due to flow reduction, and additional energy is saved due to the lower moisture load in the cooler inlet air, resulting in more energy savings when compared with heatless styles. Using the previous example, the operating cost turndown of the dryer would be roughly 20 to 25 percent for a heatless desiccant dryer, but 50 to 60 percent for heated variant if operating on dewpoint control. A paper plant installed a blower style dryer with dewpoint-dependent switching. Despite this, the plant experienced wet air in their instrument air system. A quick look at the dryer showed the produced dewpoint was well below its rated -40 oF air quality. Staff suspected an unintended bypass between the undried mill air and the dried mill air system. But, looking more closely at the dryer operation an auditor noticed free water pouring out of the after-filter of the dryer. The auditor also noticed the dewpoint controller read the same temperature no matter what, even if it was taken out of its housing and waved around in a steamy room. The probe had failed at a low temperature reading, meaning the dryer never would purge if set to dewpoint-dependent switching mode, even though the desiccant was fully saturated. Ensure any dewpoint control is working and calibrated. Always design in a way to remove free water before it reaches the dryer inlet filters. Keep the ambient conditions free of dirt and excessive moisture. Data from a compressed air audit at another paper plant showed very large notches in their pressure profile occurring every four hours. These notches were big enough to cause severe pressure fluctuations that affected production. The data showed the notches lined up with the dryer regeneration operations, occurring just after the heating operation ended. An investigation found that someone had adjusted the dryer cooling purge to an excessive level. This dryer design had a simple ball valve as the cooling air control. A tag had been placed on the valve with instructions to set it to 40 psi on the purge pressure gauge, but the tag had disappeared. We suspect someone had seen this partially open valve and decided to open it fully, causing excessive cooling air to flow. This adjustment was returned to normal and the excessive pressure drop disappeared. But since the cooling purge was still about 8% of the dryer rating, sometimes an extra air compressor still needed to be loaded every four hours to feed this additional flow. Always ensure the dryer is adjusted according to specifications. 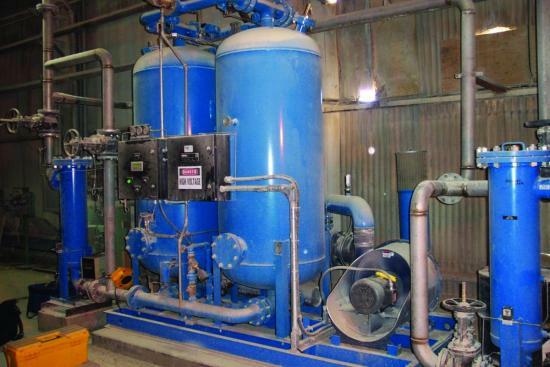 Compressed air system capacity must be sized to account for cooling purge. Dusty ambient conditions can overload the blower inlet filter. 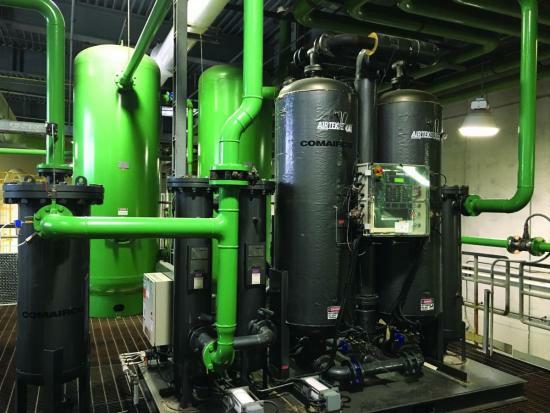 A chemical plant had a large blower purge air dryer that was sized for three air compressors, however the third air compressor was never installed. Dewpoint control was purchased as an option but had failed, and the customer never had it repaired. This dryer consumed so much cooling air that one 100 horsepower (hp) air compressor had to run to feed the flow, and the high flow caused pressure problems in the plant. The unit ran on a fixed cycle, even though it was lightly loaded, and the purge regeneration cycles could have been turned off for significant time if the dewpoint control had operated correctly. A ball valve controlling the cooling purge had also been misadjusted causing too much air into the dryer. The associated filters for this dryer had not been maintained to specifications resulting in about an 8-psi pressure differential across the filters and dryers. Ensure the dewpoint control is operating correctly and is calibrated. The dryers must be adjusted to proper cooling flow. Newer dryer designs can save energy. A meat processing plant purchased a blower style dryer as a replacement for a system that had refrigerated dryers in series with a fixed-cycle heatless dryer. The dual system had excessive pressure loss across the components. The replacement of the two types of dryers with a well-sized, single-blower purge dryer with dual parallel inlet and outlet filters improved the pressure drop, leading to better air compressor control and more stable plant pressure. The new dryer consumed much less energy than the previous system. Replacing standard dryers with well-sized units can improve system operation. If purge venting is moved to remote location, ensure piping is properly sized and the vent mufflers are not located in freezing conditions. This dryer regenerates infrequently due to lower moisture loading and dewpoint control. A food processor purchased a blower purge dryer to condition the air for their processing equipment located in a cool processing area. The dryer was purchased with dewpoint-dependent switching. The associated air compressors are water cooled, and the plant cooling water was very cold, running about 40 oF to 45 oF throughout most of the year. Since the output compressed air temperature of the air compressors runs about 50 oF (20% of rated moisture load) and the flow processed by the dryer averages about 50%, this dryer was very lightly loaded in terms of moisture. During a compressed air assessment of this system, the dryer was found to run through its regeneration cycle only once every two or three days rather than once every four hours for a typical fixed-cycle unit. This saved considerable energy. 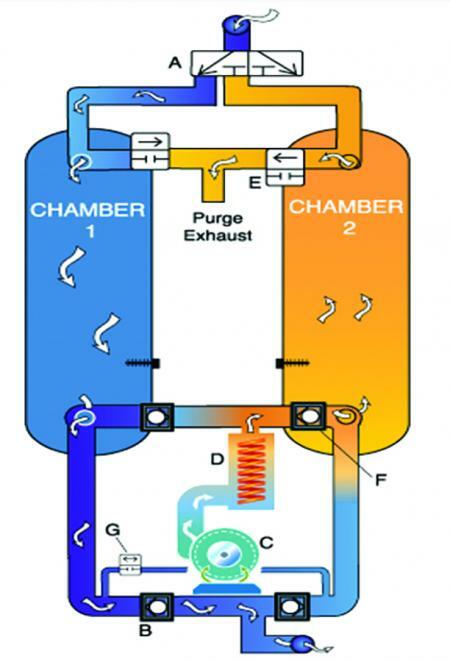 Lower temperature inlet flow for a blower purge dryer can save additional energy. Sometimes, when cycle times are spaced far apart, the cooling purge does not need to operate. If you have these conditions, and the option installed, turning the cooling off can save cooling air. A produce processor purchased a blower purge dryer with dewpoint-dependent control to condition the air in the plant, especially for color sorters, where the compressed air comes in contact with the food product. The plant piping was exposed to freezing conditions in some areas of the plant. For the most part the dryer worked well due to lighter loading conditions. The dryer regenerated on average every 12 hours, rather than every four hours. Light loading reduces regeneration cycle times. Dryer functions should be monitored to ensure expected operation, especially when commissioning is done. Installation of a flow meter can detect problems with air dryers. Use of blower purge style air dryers can reduce operating costs, especially with conditions of light loading and reduced moisture load due to cooler air compressor discharge temperatures. These units are quite complex, however, and need to be correctly maintained and monitored to make sure they stay in correct working order. Researching these dryers and monitoring them during plant compressed air assessments can result in many lessons learned. To read more Air Treatment System Assessments articles please visit https://www.airbestpractices.com/system-assessments/air-treatment-n2.